Ziploc bag painting and other toddler activities Paint in a bag! A mess free way to finger paint. 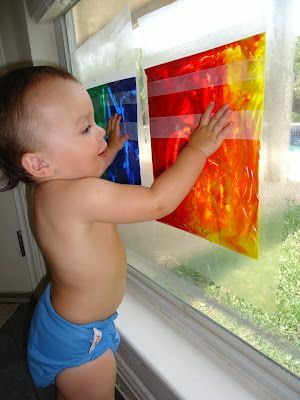 Put 2 big squirts of paint on either side of a large ziploc bag, put contact paper over the WHOLE bag and stick it to the window. The contact paper method is MUCH safer and totally mess free. You can use your finger nail to draw letters, shapes, and pictures without any rips or tears! Neat idea for baby photos! Putting these on my "to read" list.